Mrs. Davis has been a client of Personal Care Services MidSouth, LLC since December 2015. 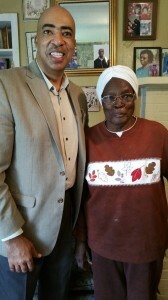 Although she has visited many places, she is a life-long resident of Winston County and Louisville, Mississippi. This past February we helped celebrated Mrs. Davis 96th birthday, and she had a lot to say! Mrs. Davis is the widow of Mr. Tom Davis and the mother of four wonderful daughters; two lives near her in Louisville with one in Ohio and the other in Washington D.C. Mrs. Davis resides in her own home and plans to stay there as long as possible. 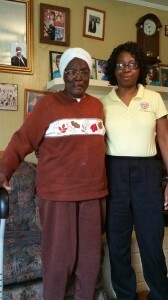 Mrs. Davis values her independences; however she loves the attention she receives from our caregiver, Annie Thomas. According to Mrs. Davis, “I love the services! I want take nothing for it. I’m pleased with my caregiver. I don’t have to do nothing! She spoils me.” Our agency is grateful to have a wonderful client like Mrs. Davis. She is one of our oldest clients! Our agency provides companionship, light housekeeping, meal preparation, run errands, and assists with personal care. For in-home caregiver service in Atoka TN, contact the caring staff at Personal Care Services MidSouth today! This entry was posted in Caregiver Atoka TN and tagged Caregiver Atoka TN. Bookmark the permalink.